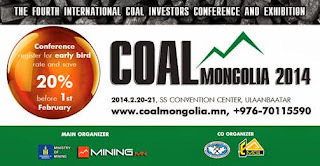 February 17 (news.mn) The Fourth international coal investors' conference and exhibition, "Coal Mongolia" 2014 will be held jointly by the Ministry of Mining, the Mineral Resources Authority and Erdenes MGL LLC on February 20th and 21st. 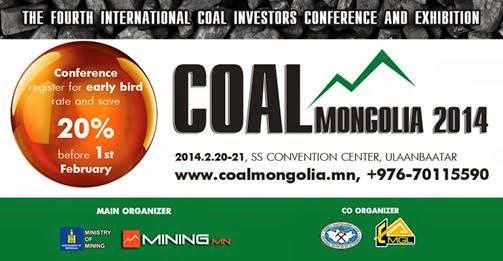 Currently over 1000 participants have been registered to attend at the fourth international Coal Mongolia conference. Mongolia`s coal supply decreased significantly as coal prices fell in the market but Coal Mongolia-2014 organizers still emphasize that the coal sector is still attractive to investors. The coal investors conference and exhibition`s key agenda will be coal production`s development strategy, Mongolia`s coal competitiveness, project finance, value added industrial production and coal energy. The Secretary of the organizing committee, B.Altanshagai, said that "first, Coal Mongolia-2014 will discuss how to attract foreign investment, second, how to introduce the latest technology and third, how to increase competitiveness." "Coal Mongolia-2014 comes just after Parliament passed the "State policy on the mineral sector" and the new Investment Law. For the conference 30 key speakers, 6 moderators and 13 panelists will be present. The Fourth international coal investors' conference and exhibition will present awards to the person of the year in coal sector of Mongolia, the best mining company and the best exploration company. SINGAPORE (Standard & Poor's) Feb. 14, 2014--Standard & Poor's Ratings Services said today that its ratings on Mongolian Mining Corp. (MMC: CCC+/Watch Neg/--) and on its outstanding notes are not affected by the proceeds from the company's sale of its road assets to Erdenes MGL LLC. 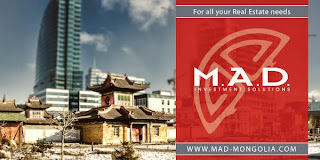 We believe relief to the company's liquidity resulting from the transaction will be mostly temporary, given MMC has about US$160 million in amortizing bank loans, interest expenses, and promissory notes between April 2014 and the end of 2014. Nevertheless, the US$90.5 million proceeds from the asset sale will support MMC's liquidity and cash position over the next two months, in our view. We estimate the company has a current cash balance of about US$70 million, which together with the sale proceeds will allow MMC to service its amortizing bank loans, promissory notes payable, and interest on its US$600 million senior notes due by the end of March 2014. We believe that MMC's liquidity position will only start to stabilize upon execution of the refinancing of its amortizing bank loans and the company addressing the promissory notes payment to a shareholder. We expect to resolve the CreditWatch over the next four weeks. In regard to your letter of 13 February 2014 the Company confirms the following as reported within the December 2013 Quarterly Activities Report issued to ASX on 31 January 2014. As the Company is at the stage of exploration and possible resource development it does not have any product sales. The negative operating cash flows relate to the expenditure associated with the process of undertaking feasibility work and obtaining the final permits required to commence mining on the Nuurst Coal Project in Mongolia. This also includes the costs associated with maintenance of a Mongolian office, Perth office and corporate travel and negotiations for a coal-off take agreement for the Nuurst Coal Project. At the end of the quarter, Modun had total cash reserves of $0.26 million. This represents the proposed estimated expenditure for the quarter following the implementation of the substantial cost reduction programme announced to the ASX on 31 January 2014. As reported within the December 2013 Quarterly Activities Report issued to ASX on 31 January 2014 the Company has implemented a substantial cost reduction programme aimed at reducing costs across the company. This will be effective until Modun can raise finance subsequent to completing negotiations with the Government regarding the off-take agreement. This includes a reduction in staff levels, the termination of all contractors, downsizing of the Mongolian Office, and a significant reduction in employee salaries across the whole company. As part of this cost cutting programme, Mr Rick Dalton resigned from his full-time position as Managing Director effective on 31 January 2014, but remains on the Board as a non-executive Director and continues to play a key role in the sourcing of a local partner and signing the off- take agreement. Mr Dalton will be paid at the same level as other non-executive Directors, being $36,000 per year. Mr Hugh Warner has now filled the executive position as executive Chairman on an annual salary of $36,000. Mr Daniel Rohr, resigned from his full-time position as Chief Financial Officer effective 31 January 2014, but will continue to work with Modun in a part time capacity on an annual salary of $50,000 per year. In addition, Mr Gerry Fahey has resigned from the Board of Directors, effective from 31 January 2014 and was replaced by the Modun Company Secretary, Mr Neil Hackett. Mr Hackett will retain his position as Company Secretary in addition to becoming a non-executive Director on an annual salary of $36,000. The changes to staffing levels will still enable Modun to progress discussions for the coal briquette off-take agreement with the Mongolian Government. However the remaining focus will be on sourcing a local partner to help fund the development of the Nuurst Project. The work associated with completing the bankable feasibility study or any other work required to advance the project has been suspended until a suitable funding partner has been found. As reported within the December 2013 Quarterly Activities Report issued to ASX on 31 January 2014 the Company is seeking to raise capital and has been in discussion with a number of potential local partners who have expressed interest in investing in Modun or directly into the Nuurst Coal Project. These discussions remain ongoing. The Company confirms that it is in compliance with the Listing Rules and, in particular, Listing Rule 3.1. The Company confirms that it is in compliance with the Listing Rules and, in particular, Listing Rule 12.2. The Nuurst Coal Project remains a substantial asset of the Company. In November 2012, Modun announced a 478 million tonne JORC Code 2004 reported Coal Resource at Nuurst (326 million tonnes Measured, 104 million tonnes Indicated, 48 million tonnes Inferred). The Nuurst Coal Project is located 120 kilometres south of Mongolia's capital Ulaanbaatar and ten kilometres from existing rail infrastructure which links directly into China. This information was prepared and first disclosed under the JORC Code 2004. It has not been updated since to comply with the JORC Code 2012 on the basis that the information has not materially changed since it was last reported. In November 2013, Modun submitted its Mongolian feasibility study for the Nuurst Project to MRAM. The Mongolian feasibility study was prepared according to Mongolian standards and is required to be completed and submitted to MRAM for review prior to the Company lodging any MRAM mining permit applications to commence mining. The Mongolian feasibility study was successfully approved by MRAM in January 2014, which enables Modun to continue with the process of obtaining the final permits required to commence mining. This is an important part of the process in Mongolia because MRAM will only issue their approval for a Mongolian feasibility study if they believe the deposit is economically viable and sustainable. The Mongolian feasibility study was independently prepared by Absolute Mining LLC who has a strong knowledge of local conditions and costs. The study identified the potential for a 136.9Mt mine of sub-bituminous thermal coal over a 30 year mining operation, with production ramping up to 4.9Mt of raw coal per annum and 500Kt of dried coal briquettes by the 4th year of operation. Indicative production costs are estimated at $US11.50 per tonne for raw coal over the life of the mine, at today's costs, reflecting the low overall mining ROM strip ratio of 2.4:1. Negotiations with the Government for the Off-take Agreement remain ongoing. Modun is seeking to raise capital and has been in discussion with a number of potential local partners who have expressed interest in investing in Modun or directly in the Nuurst Project. These discussions remain ongoing. Further, for the purposes of ensuring that the Company has sufficient funds in order to continue its operations, the Company has available the potential to raise funds through the issue of shares, the sale of assets and Directors' loan funding subject to prevailing market conditions. I refer to the Company's Quarterly Report in the form of Appendix 5B for the period ended 31 December 2013, released to ASX Limited ("ASX") on 31 January 2014, (the "Appendix 5B"). ASX notes that the Company has reported the following. 1. Receipts from product sales of nil. 3. Cash at end of quarter of $260,000. In light of the information contained in the Appendix 5B, please respond to each of the following questions. 1. It is possible to conclude on the basis of the information provided that if the Company were to continue to expend cash at the rate for the quarter indicated by the Appendix 5B, the Company may not have sufficient cash to fund its activities. Is this the case, or are there other factors that should be taken into account in assessing the Company's position? 2. Does the Company expect that in the future it will have negative operating cash flows similar to that reported in the Appendix 5B for the quarter and, if so, what steps has it taken to ensure that it has sufficient funds in order to continue its operations at that rate? 3. What steps has the Company taken, or what steps does it propose to take, to enable it to continue to meet its business objectives? 4. 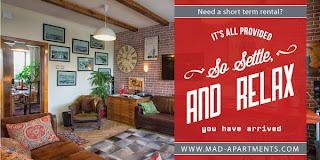 Can the Company confirm that it is in compliance with the listing rules, and in particular, listing rule 3.1? 5. Please comment on the Company's compliance with listing rule 12.2, with reference to the matters discussed in the note to the rule. 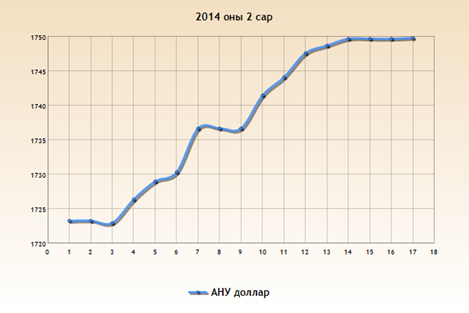 Ulaanbaatar, February 17 (MONTSAME) Five stock trades were held at Mongolia's Stock Exchange on February 10-14, 2014. In overall, 139 thousand and 882 shares were sold of 55 joint-stock companies totaling MNT 420 million 468 thousand and 212.62. "Remikon" /72 thousand and 499 units/, "Hermes center" /20 thousand and 797 units/, "State Department Store" /6,698 units/, "Gobi" /6,619 units/ and "Bayangol hotel" /6,472 units/ were the most actively traded in terms of trading volume, in terms of trading value--"Bayangol hotel" (MNT 297 million 983 thousand and 500.00), "Gobi" (MNT 37 million 926 thousand and 955.00), "Atar-Orgoo" /MNT 15 million 230 thousand and 750.00/, "Remikon" /MNT 11 million 201 thousand and 267.00/ and "APU" (MNT 10 million 074 thousand and 126.00). Ulaanbaatar, February 17 (MONTSAME) At the Stock Exchange trades held Monday, a total of 30 thousand and 279 shares of 25 JSCs were traded costing MNT 23 million 891 thousand and 697.00. "Remikon" /24 thousand and 140 units/, "APU" /1,586 units/, "Khokh gan" /1,560 units/, "Mongolian telecommunications" /651 units/ and "Tavantolgoi" /422 units/ were the most actively traded in terms of trading volume, in terms of trading value--"APU" (MNT six million 661 thousand and 200), "UB hotel" (MNT four million and 806 thousand), "Remikon" (MNT three million 679 thousand and 300), "Tavantolgoi" (MNT two million 446 thousand and 765) and "Sharyn gol" (MNT one million and 121 thousand). The total market capitalization was set at MNT one trillion 724 billion 845 million 084 thousand and 786. The Index of Top-20 JSCs was 17,153.80, increasing by MNT 449.51 or 2.69% against the previous day. BoM issues ₮174 billion 4-week bills at 10.92% p.a. In brief: The Mongolian Parliament has adopted a new State Minerals Policy, which will serve as the basis for amendments to the existing Minerals Law and other laws relating to the mining sector. Partners Igor Bogdanich (view CV) and David Wenger (view CV) and Senior Associates John Koshy and Tserena Yumjav look at what the new Minerals Policy will mean. · strengthen the competitiveness of the Mongolian mining sector on the international market. More specifically, the Minerals Policy will serve as the basis for amendments to the existing Minerals Law and other laws relating to the mining sector. A draft Minerals Law was issued at the end of 2012 for public comment and was met with significant criticism by the business community and industry groups on the basis that it would impede the efficient development of mining projects in Mongolia. The draft was issued at a time when there was substantial investor uncertainty in respect of Mongolia's foreign investment framework. The draft law was subsequently shelved in favour of amendments to the existing Minerals Law. A draft of the proposed new amendments to the Minerals Law has been prepared based on the principles of the Minerals Policy. Coupled with recent reforms to Mongolia's foreign investment laws, which we reported on previously (See Focus: Mongolia's new investment law), the Minerals Policy indicates a concerted effort by the Government of Mongolia to attract renewed investor interest in Mongolia. The Minerals Policy outlines general principles aimed at providing long-term sustainable development of the mining industry, and provides for equal treatment and non-discrimination of investors in the mining sector. Its goals include achieving more openness and transparency of State organisations and State-owned companies. The Minerals Policy also plans the gradual privatisation of State-owned companies in the mining sector and focuses on the State improving its administrative services to achieve more transparency and efficiency, and providing more support to the private sector. It is also envisaged that separate legislation will be enacted in relation to the exploration and mining of deposits of common minerals such as sand. The goal of the Minerals Policy in the geological sector is to increase the quality of, and information in, the geological database of the Mongolian State through implementing internationally recognised methods and classifications, and to intensify prospecting activities by supporting private sector involvement. An improvement of the registration and monitoring system for mineral deposits is also envisaged by ensuring that there is an annual update of the mineral reserves of Mongolia. A key objective of the Minerals Policy is to develop a transparent and responsible mining extraction and processing industry that is export-oriented, compliant with modern international modern standards and that will provide sustainable development to Mongolia. In relation to strategically important mineral deposits, the objective is to develop better cooperation between the State and the private sector while also increasing the State's control, monitoring and responsibility. The Minerals Policy does not state how this will be achieved and therefore it remains to be seen how this objective will be implemented. Finally, an important goal of the Minerals Policy is to ensure efficient monitoring by the State and or/local authorities of mining operations and the related levying of fees and charges, including avoiding any duplication of fees and charges. The Minerals Policy aims to increase the secondary processing of minerals and support value-added production through policy and legislation, including through tax and financial incentives to be offered by the State. Examples of processing projects that could receive State support include coal concentrate, coking coal and chemical plants, coal-fired power plants, liquid fuel and gas extraction out of brown coal and liquid fuel extraction out of oil shale. The Minerals Policy supports conditions that will allow investors and local communities to better understand the impact of a mining project before the commencement of mining operations, and to increase the awareness and responsibility of local authorities in presenting the social and economic impact of the mining project to the local community. A local development agreement, made between the investor and the local community as contemplated by the current Minerals Law, should be transparent and involve the stakeholders in the mining project. Environmental protection is a key aspect of the Minerals Policy, as it seeks to develop rehabilitation regulations consistent with international standards. With regards to water, it will encourage the use of surface water rather than underground fresh water In mining and processing operations, as well as the re-use of water and the use of grey water. The Minerals Policy aims to establish a 'Policy Council' with representatives of the State, investors, professional associations and the public, to make recommendations and support the implementation of the Minerals Policy. From a practical perspective, the Minerals Policy will be implemented via legislative reform and directives to the relevant regulatory authorities in Mongolia. The Government of Mongolia has indicated that it will reflect and promote the Minerals Policy in its budget process. · assessment of implementation of the Minerals Policy – 2020 and 2025. In summary, the Minerals Policy sets out objectives for the Mongolian mining sector, which should encourage both foreign and domestic investment. It will remain to be seen how such objectives are implemented through amendments to the Minerals Law and other laws, and the creation of new regulations. Investors will be interested to see how Mongolia balances the rights of State and industry, and the environment, while at the same time providing favourable conditions for the development of extractive industries and private sector involvement. Ulaanbaatar, February 17 (MONTSAME) A Mongolian delegation led by N.Lundendorj, a head of the Court's General Council, is visiting Turkey. Having arrived in Turkey February 15 at invitation of the High Council of Judges and Prosecutors, the delegation will ink a cooperation pact during the visit. Under this pact, 40 Mongolian judges will get involved in competency building trainings in the Justice Academy of Turkey every year, under funding of the Turkish side. Ulaanbaatar, February 17 (MONTSAME) Having received some offers from individuals, the Cabinet last Friday amended their regulations for cyber game centers. New regulations state closing hour of these centers as 11 pm, while setting customer minimum age as 9 years. A child aged 9-16 years can play at the game center until 8 pm in summer and until 6 pm in winter, maximum two hours a day. Terrence Edwards in Ulaanbaatar, February 17, 2014 (bne) Leaks to international media about investor concerns with management at Mongolia's third largest bank have again called into question the level of governance that exists in the country's financial sector, which has suffered three bank failures since 2008. Golomt Bank on February 12 responded to what it claimed were "misleading and false allegations" in the press about the standard of governance at the bank, and that it does not have any shareholders seeking loan repayments. Golomt Bank found itself in the headlines in January and February when media published documents purportedly showing serious failings at the bank and a fund under the control of Abu Dhabi Investment Council, Stanhope Capital, was moving to cancel early its $25m debt agreement with Golomt, citing poor management and a breach of their investment agreement. The Reuters report that first broke the story on January 27 came four months after Moody's Investors Service withdrew its credit rating of the bank, explaining "it currently does not have sufficient or otherwise adequate information to support the maintenance of the rating." Both Abu Dhabi Investment Council and Switzerland's Credit Suisse have accused Golomt of violating lending terms by failing to have their 2012 financial results audited by a top-four global accounting firm – instead pursuing audit results from the world's fifth-largest auditor, BDO. The two investors are seeking the return of loans and have engaged in arbitration proceedings over loans made to the bank, Bloomberg reported on February 5. The main point of disagreement centres around letters of credit guaranteeing payment on behalf of Mongolian gold miner Altan Dornod to Japan's Itochu Corp for mining equipment – issues that Golomt claims have long been resolved. According to the February 12 statement from Golomt, reports also misrepresented Credit Suisse's investment, which it says was a $10m convertible bond that has since been repaid. "Golomt Bank does not have any shareholders seeking repayment of loans, these are equity investments in our bank and none of our investors have signalled any intent to leave the bank," the statement said. Golomt's CEO Galsan Ganbold said in an interview translated and published in Business-Mongolia.com that the reports appearing in the media were "biased". But media bias does not explain why Bloomberg reported February 5 that Golomt's management never alerted its board to guaranteed payments to Itochu that allegedly exceeded share capital when made in 2007 and 2008. There is also the matter of management figures still reportedly working in the bank who allegedly deleted banking records and emails. A founding partner of the Bodi Group holding company that owns Golomt has also had a row with management. Last April, Luvsanvadan Bold, who also serves as the country's top diplomat as minister of foreign affairs, had his lawyer write an official letter of complaint to the governor of Mongolia's central bank about these issues after reviewing a report by FSI Capital. In the end, Bold and his partners restructured the ownership of Bodi so that Bold's interest was removed from the bank. A lack of restraint within management has cost banks dearly in the past. Last year Mongolia saw Savings Bank fail – the third bank to collapse in the country since 2008. bne reported in August that before the Savings Bank's collapse, Anod Bank filed for bankruptcy in 2008 followed by Zoos Bank 2009. Anod and Zoos both folded because the Mongolian firm Mongol Gazar had defaulted on loans that used the Olon Ovoot gold mine as collateral. The Savings Bank failure, too, was a result of a bad deal with Mongol Gazar, which sold the Olon Ovoot gold mine to the bank's parent company, Just Group. The Olon Ovoot mine failed to produce as much gold as Just Group head Sh. Batkhuu had expected, leaving Just Group unable to repay a $109m loan to Standard Bank. Mongolia's government subsequently absorbed Savings Bank into government-owned State Bank. The brouhaha surrounding Just Group prompted the rating agency Fitch to say in a statement: "We believe that much greater rigour is needed in implementing existing related-party/concentration limits to maintain financial stability, as Mongolia's volatile economy could suffer from rapid credit deterioration." Observers note that the lack of discipline is symptomatic of a market still developing just two and half decades after transitioning to a market economy. "They don't have clear guidelines," says Michael Preiss, a guest lecturer for the Banking and Finance Academy of Mongolia. "Then you have middle management which doesn't know how to go about these things in a procedural way." Given that the $25m loan from the Abu Dhabi fund represents just 1% of Golomt's assets, the bank looks to be clear of any present danger. However, the bank will need to overhaul its governance structure to prevent any future disaster. The bank also in February joined the Asian Financial Corporation Association, a regional group that claims to help members maintain compliance with standards and address risks. The banks in Mongolia will have to clean up their image if they are to pull in the investment needed to keep up with Mongolia's rapid pace of growth. Tight liquidity has been a recurring problem in Mongolia, with Moody's naming it as a likely issue in an April 2013 outlook on the country's banking system. Preiss, who is also managing partner at Mongolia Asset Management, said although the bad press won't be doing Golomt any favours, it really shouldn't be the final word on the bank. "The franchise is quite profitable. Overall it's a good bank," he says. "Investors will do their own due diligence and look at the case for themselves." 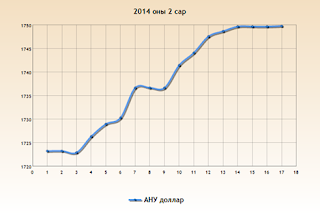 Mongolia's banks will also increasingly have to compete with foreign entrants to the market. Bank of China and Japan's Sumitomo Mitsui Banking Corporation have opened representative offices within the past six months, while Bank of Tokyo-Mitsubishi UFJ and Standard Chartered have also applied to open their own branches in the capital. ING was the first foreign bank to set up shop here, last year observing its five-year anniversary. Still, those banks are at a decided disadvantage to the local banks, according to a note from the Ulaanbaatar branch of the global law firm Hogan Lovells. "With respect to the entry of foreign banks into the Mongolian market, the Bank Licensing Regulations impose greater restrictions," reads a July 2012 note on updates made to the country's banking law. The note says Mongolian law prohibits representative offices from profit making, and that those offices must be in operation a year before they can establish Mongolian subsidiaries. They are also expected to have a minimum share capital of $50m, "which is much higher than the minimum capital requirement [$12m] for an existing Mongolian bank." With such controls in place, foreign banks might prefer to buy into existing local banks rather than open their own subsidiaries. Bringing international practices to their new acquisitions would in itself help solve the current problems with transparency and governance. February 17 (Golomt Bank) Leading bank of the Mongolian banking sector, Golomt bank signed an "Enterprise agreement" with the world renowned "Microsoft Corporation" on February 14, 2014. In 1975, Paul Allen and Bill Gates registered their software engineering company 'Micro-Soft' which marked beginning of the phenomenal history of humankind. "Microsoft Corporation" is not only world's largest software manufacturer and developer but also the largest service provider of personal computer. According to the 'Enterprise Agreement' with the Microsoft Corporation, for the first time in Mongolia, Golomt bank will have an access to all of the latest editions of Microsoft products which are particularly tailored to fit the needs of the bank along with technical services and repairs of the product. Furthermore, daily operations of the bank will step into next level by increasing number of products and services for the customers and by strengthening the safety of the service with double protection. In other words, "Microsoft Corporation" will also be responsible for the safety and insurance of the programs. Furthermore, Golomt bank cooperated with the Infosys in 2012, global leader in the information technology, to introduce and implement "Core Banking" project with purpose of improving bank's core information system technology. "Core banking" project is the latest technology advancement to be introduced in global banking leaders and the project of Golomt bank will be completed in summer of 2014. Moreover, world renowned financial magazine, Global finance named Golomt bank, a first bank to introduce e-banking in Mongolia, as the "Best Internet Bank" of 2013. Ulaanbaatar, February 17 (MONTSAME) The Minister of Health N.Udval Thursday received delegates of the Microsoft Dynamics CRM led by Mr Pilar Torris, a country manager. The delegates spoke about new products and services being introduced in health sector of several countries and expressed views on running cooperation in this sector with our country. They also highlighted their opportunities to license all Windows operating systems and based on them other software and to introduce information management network in the Ministry and health organizations. Then the sides focused on possibilities of cooperating in developing of Microsoft products. February 11 (Routes Online) Mongolian carrier Hunnu Air has announced plans to launch a limited schedule of flights between Ulaan Bataar and the French capital, Paris, between June and August this year. This will be the first long-haul service for the company, formerly known as Mongolian Airlines, and will be likely initially be operated using an Airbus A319 with an intermediate technical stop prior to the arrival of a leased Airbus A330-200 in 2015. Hunnu Air launched operations in February 2012 and until now has mainly focused on serving the domestic Mongolian market. It currently offers internal flights to Altai, Bayankhongor, Choibalsan, Dalanzadgad, Donoi, Hailar, Hovd and Murun using three Fokker 50s and had a 42.7 per cent share of the seat capacity in the domestic market last year, up from 28.9 per cent on 2012, overtaking Eznis Airways as the country's largest domestic carrier. International operations commenced in June 2012 with the launch of flights between Ulaan Bataar and Hong Kong and subsequently scheduled operations have been introduced to Bangkok (from June 2013) and Shanghai (from February 2013 , although this route was closed in October 2013). Hunnu Air also offers seasonal charter flights to several Japanese cities and destinations in Russia and this year added a link to Manzhouli, in the Inner Mongolia Autonomous Region of the People's Republic of China. The international routes are all served by two Airbus A319s configured in a two-class arrangement with 12 Business Class and 108 Economy seats. The airline's long-haul plans are not new as it confirmed at the International French Travel Market (IFTM) in Paris that the French capital would be its first long-haul destination. The opening of reservations this week follows the award of the relevant permissions and clearances to serve this market. According to schedules, Hunnu Air will offer a twice weekly service (every Monday and Friday) between June 9, 2014 and August 29, 2014. The Amadeus GDS currently lists that this 11 hour service will be operated on a non-stop basis using an A319, however, the carrier is understood to be formalising the lease of a single A330-200. This aircraft is also expected to be used to launch a new link to Singapore in early 2015. This will be the sole non-stop service between Ulaan Bataar and France and only the second European market to be served directly from Mongolia after Germany, which has been linked to Ulaan Bataar by the flights of MIAT - Mongolian Airlines from Berlin and Frankfurt. According to MIDT data, an estimated 134,000 bi-directional O&D passengers flew between Europe and Mongolia in 2013: approximately 14,000 of these passengers (10.8 per cent) flew from or to destinations in France. In the analysis below we look in greater detail at the O&D demand between Mongolia and Europe, highlighting the largest markets across the Continent for inbound and outbound visitors from Mongolia last year. This is dominated by the German and Russian markets, although alongside France there is also a notable demand from the UK, which could potentially be a future destination for a Mongolian carrier. Taipei, Feb. 17 (CNA) Taiwan and Mongolia signed a memorandum of understanding Monday to establish institutionalized cooperation in renewable energy generation and energy efficiency management. The document was signed in Taipei by officials representing the Ministry of Economic Affairs (MOEA) and Mongolia's Ministry of Energy. Both Taiwan and Mongolia have excellent potential for developing renewable energy such as solar and wind power, said Deputy Minister of Economic Affairs Duh Tyzz-jiun. In addition to cooperating on the development and management of renewable energy, MOEA Bureau of Energy (BOE) Director-General Wang Yunn-ming said Taiwan is ready to share its experience in replacing aging coal-fired electricity generators with Mongolia, which relies on coal for 48 percent of its overall power generation. Taiwan has made great strides in the development of solar and wind power, but companies in the sector are restricted in their ability to enter overseas markets by a lack of internationally recognized success, the BOE said. The memorandum is expected to help Taiwanese companies establish a record of success with which they will be able to expand their business opportunities, according to the BOE. MINSK, 17 February (BelTA) – BelAZ dump trucks with the lifting capacity of 110 tonnes have been put into operation at the coal minefield Tavan Tolgoi in the Gobi desert in Mongolia, BelTA learnt from the company. The first batch of BelAZ 75135 dump trucks were delivered to the company Khishig Arvin at the end of 2013. The machinery was assembled and mounted under the supervision of technical experts of the Zhodino-based company. Khishig Arvin has plans to buy more Belarus-made dump trucks in the future. The coal minefield Tavan Tolgoi is located in the south of Mongolia's Gobi desert. It is one of the world's biggest coal minefields (6.5 billion tonnes of coal). The Belarusian company informed that Mongolian companies are very well familiar with Belarus-made dump trucks. Mongolian companies have been operating these trucks for quite a long time and have plans to keep doing it in the future. BelAZ dump trucks have been exported to Mongolia for several decades already. Since the 1970s BelAZ dump trucks have been used at the Erdenet copper and molybdenum deposits. Besides, BelAZ-75131 dump trucks (130 tonnes), BelAZ 7530 dump trucks (220 tonnes) and BelAZ 76473 vehicles that were shipped to Mongolia in the recent years have been operated at the Nariin Sukhait coal mine and the Tsagaan Suvarga copper and molybdenum deposits. Founded in September 1948, the Zhodino-based automobile engineering company Belarusian Autoworks (BelAZ) was incorporated into a public joint-stock company in 2010. As of October 2012 OAO BelAZ is the management company of BelAZ Holding Company, which comprises six enterprises. BelAZ specializes in making mine dump trucks, frontal wheeled loaders and bulldozers, tow trucks, special vehicles for underground operations, heavy-duty trucks for metallurgy industry, and other specialized vehicles. BelAZ accounts for a third of the global market of rock haulers. February 17 (infomongolia.com) On February 14, 2014, the President of Mongolia Tsakhia ELBEGDORJ and the Chancellor of the Federal Republic of Germany Angela Merkel spoke by telephone regarding issues on bilateral relations and works being co-implemented; besides parties exchanged views on some regional issues of mutual concern. The 40th anniversary of the establishment of diplomatic relations between Mongolia and the Federal Republic of Germany marks in 2014, where formerly the People's Republic of Mongolia signed the document of diplomatic ties with the East Germany on January 31, 1974, during the period when Germany was divided into two states, the East Germany and West Germany after the WWII, which was re-unified in 1990. Ulaanbaatar, February 17 (MONTSAME) M.Batchimeg and N.Nomtoibayar MPs have taken part in the Parliamentary Assembly 2014 Winter Meeting of the Organization for Security and Co-operation in Europe (OSCE). It ran February 13-14 in Vienna, Austria. As a head of OSCE Group at the State Great Khural (parliament), Batchimeg delivered speeches at meetings of the Committee on politics and security affairs and of the PA's leading committee. Mongolian parliament intends to cooperate with the OSCE in security matters reform and to seek a right to host the 2015 Autumn Meeting of the PA.
Our delegation also held individual meetings with Mr Ranko Krivokapic, OSCE PA President, and with Mr Lamberto Zannier, the OSCE Secretary-General. The OSCE PA has held annual Winter Meetings at the OSCE headquarters in Vienna since 2002 to provide an opportunity for OSCE parliamentarians to be briefed by high-level OSCE officials. The meeting also serves as an opportunity for members to hear presentations by the three committee rapporteurs and to discuss their draft reports for the upcoming Annual Session. Organized by the OSCE PA, this year's Winter Meeting ran at the Hofburg Congress Centre in Vienna with participation of 270 parliamentarians from more than 50 OSCE participating states to conclude with special debates on "The Current Situation in Ukraine" and "The Rise of Extremism, Radicalism and Xenophobia: Challenges for the OSCE Region." The opening session of the Winter Meeting was addressed by OSCE PA President Ranko Krivokapic and Barbara Prammer, President of the National Council of Austria. In his remarks, President Krivokapic emphasized the importance of active parliamentary engagement in the OSCE. Ulaanbaatar, February 17 (MONTSAME) On Thursday, the Ambassador Extraordinary and Plenipotentiary of Mongolia to Mexico B.Altangerel (Mogi: resident ambassador to the US) attended an opening ceremony of Mexico-Mongolia parliamentary friendship group. The event took place at the Chamber of Senators of the Honorable Congress of the Union. Our Ambassador gave a presentation on present social and economic situation of Mongolia and bilateral relations and cooperation. Then he had a talk with Ms Barcenas Nieves, a head of this parliamentary friendship group, and shared views her on expansion of inter-parliamentary ties. After this, our Ambassador visited a Secretariats of Public Education and of Tourism and proposed running student and teacher exchange programs in mining field and increasing tourists' flow. The Ambassador also met with some officials to focus on issues such ways of marking the 40th anniversary of the diplomatic relation establishment next year September 24. February 17 (news.mn) The Governor of Sukhbaatar aimag has announced about the good preparedness in Dariganga, Naran, Ongon, Bayandelger and Tuvshinshiree sums in Sukhbaatar aimag where there has been an outbreak of the A listed serious animal infectious disease foot-and-mouth. High alerts were established in other sums in Sukhbaatar aimag to prevent the epidemic from spreading to neighboring aimags and sums. The high alert preventing the spread of foot-and-mouth disease in quarantine centers in sums and quarantine prohibiting any entry and exit were set in the sums. Due to the strength of the quarantine, all vehicle traffic between Baruun-Urt and Ulaanbaatar was banned except for postal vehicles. Moreover any movement of animal products has been banned. According to the decision by the governor of Sukhbaatar aimag, civilians and farmers will widely be involved in animal vaccinations that are to be completed in a week. The local post office is charged to open for 24 hours during these days. Amar Purev, a square-jawed preserve ranger with a no-nonsense demeanor, peers through binoculars from the window of an SUV as it bounces along a double-track path through a green-and-golden sea of hip-high grass. He spots only a few gazelles in the distance, but when the vehicle crests a hill, it halts: Fifty yards away, hundreds of gazelles and their calves graze on stipa, or feather grass. Before Purev can open his door, the animals take off, coursing 40 miles per hour across the flat and boundless expanse that reaches to the horizon. This grassy ocean is Mongolia's Toson Hulstai Nature Reserve, a protected area of more than 1 million acres. It is part of a 68 million-acre expanse of grasslands that stretch from forests to desert across the country's Eastern Steppe. The steppe is the largest intact temperate grassland on Earth, and this reserve protects calving habitat for the Mongolian gazelle, whose herds can eclipse the horizon with thousands of animals. Scientists estimate the gazelle population here at a million, rivaling the wildlife herds of Africa's Serengeti. "It's one of the world's great free-ranging wildlife populations, and very few know about it," says Enkhtuya Oidov, The Nature Conservancy's Mongolia program director, from the front passenger seat of the vehicle. Roughly a decade ago the Conservancy contributed to a global analysis that illuminated the vulnerable status of grasslands in Mongolia—on which gazelles depend. "Even I didn't realize we had such a globally significant landscape," she says. About 200 herding families share the local grasslands with the wildlife and carry on Mongolia's nomadic culture, which long predates the conquering khans. The herders often track the gazelles to find good water sources and pastures, and even to predict "dzuds"—the dreaded severe winters that can kill livestock. "Gazelles," says Amar (who, like most Mongolians, goes by his first name), "are a much better indicator of weather than the forecast from satellites." Over the past five years, Enkhtuya and her staff have met with herding families around Toson Hulstai to explain how their centuries-old local practices have preserved a substantial chunk of the world's remaining grasslands—the planet's least-protected and most-altered natural landscape. That message has motivated a cooperative movement among people across the reserve and ushered in environmental protections and safeguards for herders. Renewed support from the government and backing from the Conservancy have reduced poaching, curbed harmful land uses, and restored wetlands and wildlife habitat. Amar, who was formerly the sole ranger on the reserve, is now one of six men patrolling Toson Hulstai. "We have made progress," Amar says. "But, of course, things don't change overnight." In Mongolia, that last part is actually only half true. A massive transformation is riding like a tidal wave over the country. Since the fall of communism in Mongolia and the collapse of the Soviet Union in the early 1990s, Mongolia has shifted to a parliamentary democracy with a market economy and has undergone astronomical development—driven by the pursuit of its untapped mineral wealth. A country where more than 40 percent of the population lives in felt tents and follows a traditional nomadic lifestyle, Mongolia is now trying to strike a crucial balance, developing its resources while protecting its cultural and natural heritage.